Pyonkee is a real visual-programming environment for iPad. 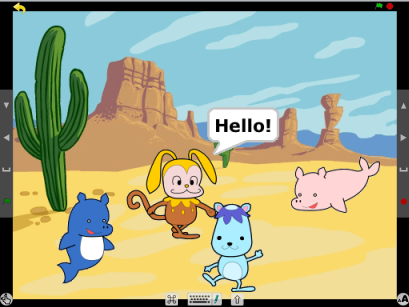 It is based on Scratch from the MIT Media Lab. 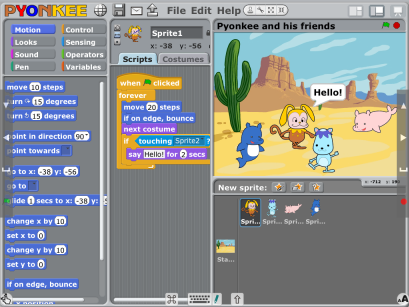 Projects made for Scratch are compatible with Pyonkee. 2018/9/27Pyonkee 2.8 is out! Now you can import MP3 files as sounds! 2018/5/15Pyonkee 2.7 is out! We have improved German translation and added German video tutorial. Most panes are now touch-scrollable! 2018/2/9Finally, Pyonkee downloads have reached over 1 million! Thanks everyone! 2018/1/31Pyonkee 2.6 has been released! Improved sound playback response. Fixed "play note" block minor bugs. 2017/10/3Pyonkee 2.5 is out! Now supports iOS 11! 2017/8/26Pyonkee has just become 3 years old! Thanks to everyone! 2017/8/22Pyonkee 2.4 is out! Memory limit setting is now up to 400 MB for large projects. 2017/8/20We've reached 700,000 over downloads. Thanks everyone! 2017/6/30Pyonkee workshop will be held on August 8 in Shibuya-ku Hachirabo! 2017/6/3Pyonkee workshop - "Children's Technology Challenge" will be held on Jun.24 in Hamarikyu Asahi Hall. 2017/5/17Pyonkee 2.3 is out! iCloud based project/sprite/costume/sounds sharing. More than 100 instruments are available in sound block. You can even play other synth apps via Virtual MIDI! 2017/2/4We've reached 500,000 over downloads. Thanks everyone! 2016/8/26Pyonkee has just become 2 years old. The number of downloads reaches 250,000! 2016/7/13Pyonkee worksop - let's try programming will be held on August 19 in Tama Kids Factory! 2016/7/5Pyonkee workshop will be held on August 5 in Shibuya-ku Hachirabo! 2016/6/2Pyonkee workshop - "Children's Technology Challenge" will be held on June 18 in Sendai International Center. 2016/2/20We've reached over 128,000 downloads of Pyonkee! 2016/2/3We are demonstrating Pyonkee on Constructionism 2016 Thanland! 2016/1/6Pyonkee workshop - "Children's Technology Challenge" will be held on Feb.20 in CTC Kasumigaseki office. 2015/10/11Pyonkee workshop - "Children's Technology Challenge" will be held on Nov.21 in CTC Kasumigaseki office. 2015/9/27Pyonkee 2.2 has been released! Now it supports iOS 9. 2015/9/5The number of downloads of Pyonkee reached 50,000. Thank you for your support! 2015/8/27Pyonkee has just become 1 year old! Thanks to everyone! 2015/7/31Pyonkee workshop - "Children's Technology Challenge" will be held on Aug.26 in CTC technology center. 2015/7/7Pyonkee 2.1 is out! Now you can make programs using iPad sensors and share variables/events with Mesh! 2015/6/28Today Pyonkee started Twitter. Please follow him! 2015/6/1Pyonkee 2.0 is out! Fixed the photo importing feature. Updated Chinese translations. 2015/5/22Pyonkee 1.9 is out! Now you can share projects via AirDrop! We also added Chinese translations, and 64 bit support. 2015/3/10Pyonkee 1.8 is available. Portrait view on presentation mode, improved photo tools, and more! 2015/1/19Pyonkee workshop will be held on Jan.25 in Setagaya Carrot Tower. 2014/10/30Pyonkee workshop will be held on Nov.12 in Aoyama Benesse. 2014/10/1Pyonkee now supports iOS 8! 2014/9/11Pyonkee video tutorial is up on YouTube. 2014/8/26Pyonkee is now available on App Store! 2014/8/9Pyonkee demonstration was held on Scratch Conference 2014. 2014/7/25We are developing Pyonkee in full speed. Please stay tuned. Is it possible to import existing Scratch projects? From version 1.9, you can share projects via AirDrop! Please update Pyonkee if you are using older version. Is it free to use Pyonkee on classrooms? It is completely free. If you would like to customize Pyonkee for your purposes, please contact us. I would like to delete a project, but I am not sure how to do it. If you keep selecting a project on FileDialog (by long-tap), a menu for removing/renaming project will be shown. Example projects are read-only, so you can not remove them. I would like to use iPad sensor values block. But I'm not sure where to access them. Please E-mail us for inquiries. Pyonkee source code is available on github. 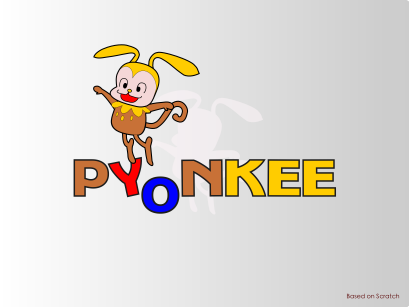 Pyonkee has been developed with great help of OSS activities.